2017 年 4 月リリース以降の Power BI Desktop では、クエリ エディターを使い、新しい列のサンプル値を指定するだけで、モデルに新しいデータ列を追加できます。Starting with the April 2017 release of Power BI Desktop, you can add new columns of data to your model using Query Editor by simply providing one or more sample values for your new column. 現在選択されているものから、または特定のテーブルのすべての (または選択されている) 列に基づいて入力を提供することで、新しい列の例を作成できます。You can create a new column example from a current selection or provide input based on all (or selected) columns in a given table. 新しい列に設定するデータの結果はわかっているものの、それを実現する変換 (または変換のコレクション) がわからない。You know the data result you want in your new column, but you're not sure which transformation (or collection of transformations) will get you there. 必要な変換は既にわかっているものの、それを実行するために UI のどこをクリックまたは選択すればよいかわからない。You already know which transformations you need, but you're not sure where to click or select in the UI to make them happen. M の "カスタム列" 式を使って行う必要がある変換についてはすべてわかっているものの、そのような式の 1 つ (または複数) を UI でクリックまたは追加できない。You know all about the transformations you need using a Custom Column expression in M, but one (or more) of those expressions aren't available to click or add in the UI. 例からの列の追加機能の使い方は簡単です。Using the add column from example feature is easy and straightforward. 以下ではそれについて説明します。In the next few sections, we see just how easy it is. 例から新しい列を作成するには、クエリ エディターを起動します。To create a new column from an example, launch Query Editor. 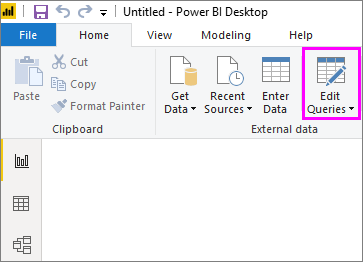 それには、Power BI Desktop の [ホーム] リボンで [クエリを編集] を選びます。You can do this by selecting Edit Queries from the Home ribbon in Power BI Desktop. クエリ エディターを起動してデータを読み込んだ後は、例からの列の追加を始めることができます。Once Query Editor is launched and you have some data loaded, you can get started adding a column from examples. 新しい列を追加するには、クエリ エディターでリボンの [列の追加] タブを選び、[例からの列] を選びます。To add a new column, in Query Editor select the Add Column tab on the ribbon and select Column from Examples. ドロップダウンを選んだ場合は、[すべての列から] (ドロップダウンではなくボタンを選んだ場合の既定値) または [選択範囲から] を選ぶことができます。If you choose the drop-down, you can select either From All Columns (the default, if you just select the button instead of the drop-down) or select From Selection. ここでは、[すべての列から] を選んだ場合について説明します。In this article, we'll walk through selecting From All Columns. 例から新しい列を追加する選択を行うと、現在のテーブルの列が新しいウィンドウに表示されます (すべてを表示するにはスクロールが必要な場合があります)。Once you make a selection to add a new column from examples, a new pane appears that shows the columns in the current table (you may need to scroll to see them all). 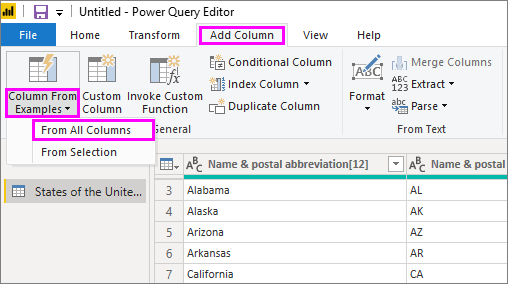 新しい [列 1] も右側に表示されます。Power BI Desktop は例を基にしてこの列を作成します。The new Column1 is also shown to the right, which is the column that Power BI Desktop creates based on your examples. 新しい [列 1] ヘッダーの下には空白のセルがあります。ここに例を入力すると、Power BI はそれを使って例と一致するようにルールと変換を作成します。Below the new Column1 header, there are blank cells where you can type your examples that Power BI uses to create rules and transformations to match your example. これは [クエリの設定] ペインの [適用したステップ] であることに注意してください。Notice that this is an Applied Step in the Query Settings pane. クエリ エディターは変換ステップを記録し、それを順番にクエリに適用します。As always, Query Editor will record your transformation steps and apply them to the query, in order. コマンド バーには、機能または変換の簡単な説明が表示されます。The Command bar that includes a brief description of the feature or the transformation. [フィードバックの送信] オプションは、この機能の向上に役立ちます。The Send Feedback option to help Power BI improve this feature. [OK] ボタンを選ぶと変換がコミットされて列に追加され、[キャンセル] ボタンを選ぶとキャンセルできます。The OK and Cancel buttons, which let you commit your transformations and add the column or cancel. 新しい列領域では、任意の行にサンプル値を入力し (Power BI に例を提供します)、その行の他の列に関連付けます。The new column area, where you can type your sample values in any of the rows (to provide Power BI with your example), relating to other columns in that row. 新しい列に例を入力すると、Power BI は検出された変換に基づいて、作成している列のプレビューを表示します。As you type your example in the new column, Power BI gives you a preview of how the column it's creating will look, based on the transformations it detects. たとえば、テーブルの最初の列の Alabama という値に対応する「Alabama」を最初の行に入力します。For example, if you type Alabama in the first row, it corresponds to the Alabama value in the first column of the table. 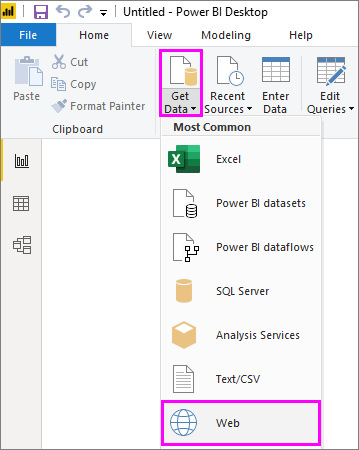 Enter キーを押すとすぐに、Power BI はその値に基づいて列を設定します。As soon as you press Enter, Power BI fills in the column based on that value. しかし、Massachusetts[E] を含む行に移動し、最後の [E] を削除します (必要ないため)。But, then say you go to the row that includes Massachusetts[E] and delete that last [E] portion (because you don't want it anymore). Power BI は変更を検出し、例を使って変換を作成します。Power BI detects the change and uses the example to create a transformation. 上の中央のペインに表示される変換の説明に注意してください。Notice the explanation of the transform in the upper-middle pane. 例の提供を続けると、クエリ エディターはそれを変換に追加します。As you continue to provide examples, Query Editor adds to the transformations. 問題がなければ、[OK] を選んで変更をコミットできます。When you're satisfied, you can select OK to commit your changes. この動作を確認したい場合は、Want to see this working? この例で前に提供したデータ ソースを使って行われるこの機能の処理を、次のビデオで見ることができます。The following video shows this feature being put to use, using the data source provided earlier in this example. これを参考にして、自分でやってみてください。Take a look and follow along for yourself! [例から列を追加する] では多くの変換を使うことができますが、すべてではありません。There are many transformations that are available when using Add column from Examples, but not every transformation is included. 次の一覧では、サポートされているすべての変換を示します。The following list provides all of the supported transformations. すべての Text 変換では、列の値のトリミング、クリーン、または大文字小文字変換の適用の必要性が考慮されます。All Text transformations take into account the potential need to trim, clean, or apply a case transformation to the column value. すべての Date および Time 変換では、列の値を Date、Time、または DateTime に変換する必要性が考慮されます。All Date and Time transformations take into account the potential need to convert the column value to Date or Time or DateTime.